For the 2003 film, see Coney Island Baby (film). For the barbershop song, see Goodbye, My Coney Island Baby. 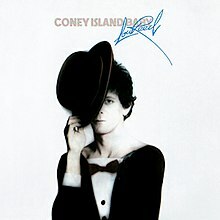 Coney Island Baby is a 1976 solo studio album by Lou Reed, released in January by RCA Records. The album includes the song "She's My Best Friend", a version of which was originally recorded by Reed's band the Velvet Underground in 1969, and eventually released on the 1985 compilation album VU. The 30th-anniversary re-issue of Coney Island Baby includes bonus tracks featuring Reed's Velvet Underground bandmate Doug Yule. Reviewing for Rolling Stone in 1976, Paul Nelson wrote, "For the eight superb songs on Coney Island Baby, Reed assembled the best band he has performed with since the Velvet Underground. Michael Suchorsky's versatile, controlled drumming is especially praiseworthy, and Reed himself has even managed to rekindle his intense, individualistic guitar playing of the late Sixties. Better yet, he has shelved his recent FM-DJ vocal style in favor of confident, expressive singing. The songs themselves—as structured and melodic as any Reed has written — are timeless, terrific rock & roll, and the strength of the genre is accentuated by the simplicity and logic of crisp, tactile production (by Reed and Godfrey Diamond) and careful, resourceful arrangements which emphasize both electric and acoustic guitars and inventive background vocals." In Christgau's Record Guide: Rock Albums of the Seventies (1981), Robert Christgau said, "At first it's gratifying to ascertain that he's trying harder, but very soon that old cheapjack ennui begins to poke through. Oddly, though, most of the cheap stuff is near the surface—the songs sound warmer when you listen close. And not even in his most lyrical moments with the Velvets has he let his soft side show as nakedly as it does on the title cut." ^ DeCurtis, Anthony. Lou Reed: A Life. New York: Little Brown. p. 180. ISBN 978-0-316-37654-9. ^ DeCurtis, Anthony. Lou Reed: A Life. Little Brown. p. 180. ISBN 978-0-316-37654-9. ^ a b Christgau, Robert (1981). "Consumer Guide '70s: R". Christgau's Record Guide: Rock Albums of the Seventies. Ticknor & Fields. ISBN 089919026X. Retrieved March 10, 2019 – via robertchristgau.com. ^ "Lou Reed: Coney Island Baby | Album Reviews". Pitchfork. 2006-10-09. Retrieved 2013-12-10. Hinckley, David (5 July 2004). "Court and Spark: Boys and Girls Together Down at Coney Island". New York Daily News. Archived from the original on 11 August 2007. Mentions the Catalano/Alonzo song. This page was last edited on 11 March 2019, at 01:41 (UTC).